Holds most 30 to 63 inch Flat Panels with a Distance from the wall to the back of the Monitor of 1.22 inches with the 18.89 inch Mounting Rails Adjustable from 4 to 30 inches in width Left to Right. It has a Load capacity of 165 lbs. and comes in a Silver or Black finish. This mount is designed to attach to at least 2 studs or other suitable support surface and primarily composed of formed, arc welded steel. 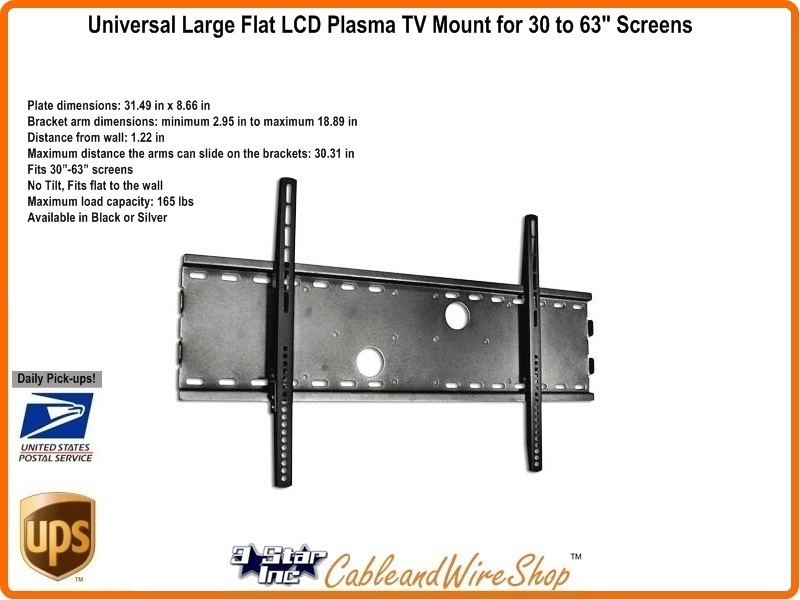 Cable & Wire Shop stocks large LCD HDTV mounts for wall & ceiling installation. Choose from TV mounts with tilt capabilities, flush wall mounting and universal applications. Our mounts are perfect for TVs 37" inches and up. We also carry Mid-Size Flat Panel TV Mounts and Small Flat Panel TV Mounts for any application.